North Carolina’s ABC system restricts the sale of spirituous liquor in this state to an average of just 4.3 stores per county operated by local government boards. Private companies are not allowed to distribute or sell liquor in North Carolina. This, you’ll recall, is to protect us from the evils of alcohol. 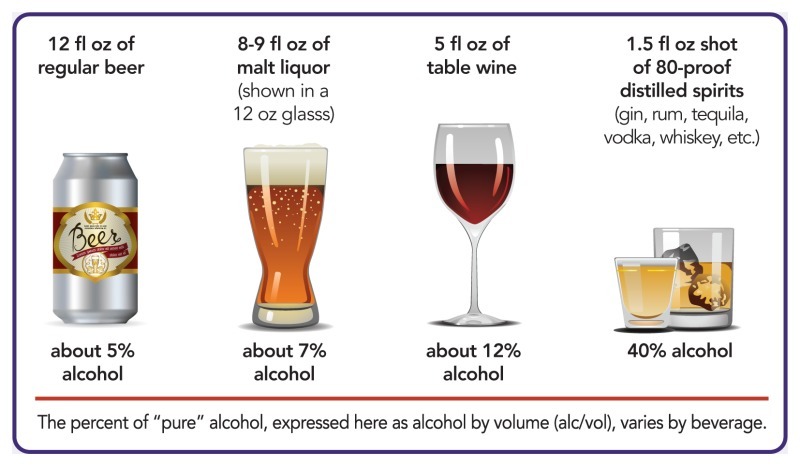 All of these drinks contain 14 grams (0.6 ounces) of pure alcohol. Data from the National Institute on Alcohol Abuse and Alcoholism include the per-capita consumption amounts of liquor in each state in 2016. The Southeastern region of the United States contains a mix of control states (including North Carolina) and license states. Do tight control and limits on the number of stores selling liquor seem to make a difference? These data suggest they might. As you can see, the states controlling retail sales of liquor have among the lowest per-capita consumption of liquor of the 14 states in the region. 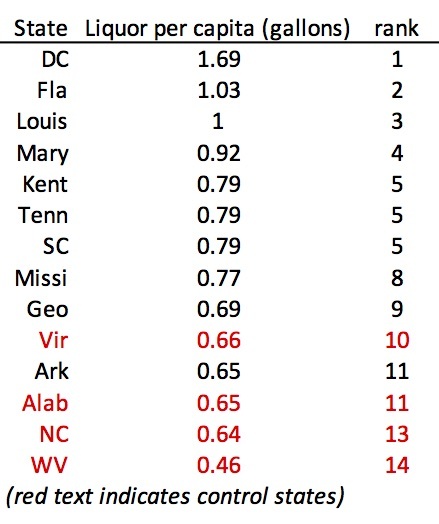 North Carolina is 13th out of 14. Control appears to be working, but is it working? I think the Standard Drink idea dovetails with what economists call “substitute goods.” Simply put, a substitute good is any good consumers turn to when the price of a similar good increases. In this case, if you make it more difficult (just a handful of stores, limited hours, etc.) and expensive (government-set prices) to get one kind of alcoholic beverage (liquor), people will substitute some liquor purchases for other kinds of alcoholic beverage purchases that are much easier to make. Beer, for example. Look how the liquor control states fare in terms of beer consumption per capita. Suddenly they’re in the middle of the pack, with one (West Virginia) ranking third overall. 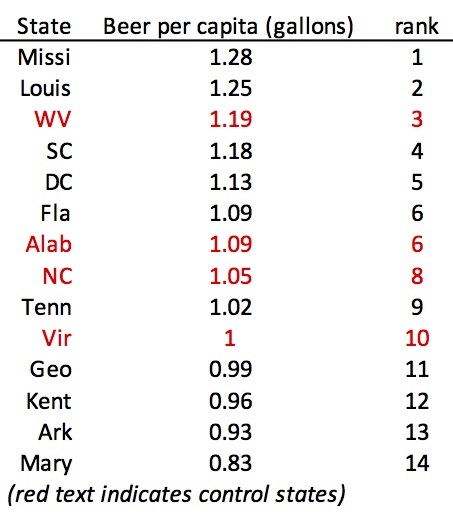 North Carolina ranks 8th out of 14 in that measure. The other shoe drops when looking at wine sales per-capita. 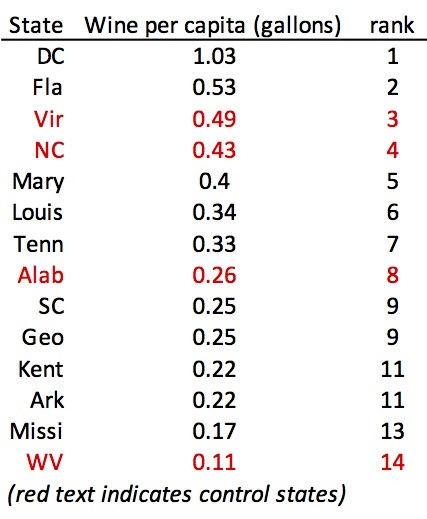 Two liquor control states round out the top four, Virginia (3rd) and also North Carolina (4th). 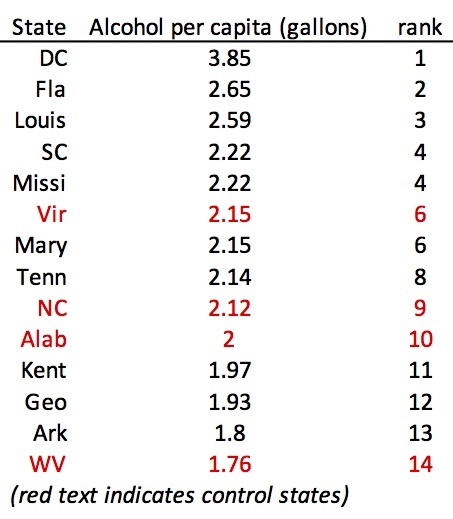 Keeping the Standard Drink chart in mind and combining liquor consumption with beer and wine consumption, what were the Southeastern state’s overall per-capita consumption for alcohol in 2016? Suddenly, the picture of control isn’t so clear. At least not in practical terms.